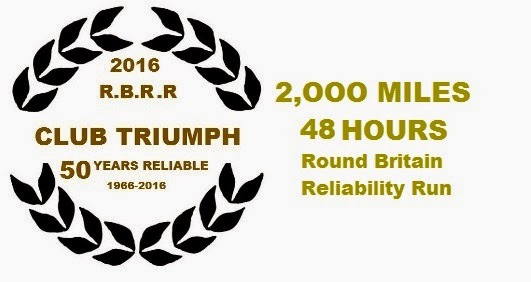 1 Announcement: The Touring Assembly known as the 25th Round Britain Reliability Run as organised by Club Triumph will take place over the weekend of Friday 7th October 2016 to Sunday 9th October 2016, starting at 18.00hrs on the Friday and finishing 48 hours later. The event will start at ‘The Plough’ Public House, Cattlegate Road, Crews Hill, Enfield, Middlesex EN2 9DJ (This could be subject to change), the finish at the Banqueting Barns, Knebworth House, near Stevenage, Hertfordshire. The event will support national charity, this time it will be Guide Dogs. 2 Jurisdiction: The event will be held under the general rules of the MSA as a Touring Assembly and those supplementary regulations and any written instructions that the organising club may issue for the event. A MSA Touring Assembly Permit will be applied for and be available for perusal at the start. 6 Entries and Entry List: The Entry Fee is £100.00 for each member of a crew. The entry list opens with the publication of the November 2015 issue of the Club’s bi-monthly magazine ‘Club Torque’. The entry list closes on Friday 30th September 2016. Full refunds for the withdrawal of entry will be made if received prior to 31st July 2016. After that date, refunds will be made at the organisers discretion. Please submit entries completing the form below with cheque made payable to: Club Triumph Limited and send to Jason Chinn, 35 Goodliffe Gardens, Tilehurst, Reading, Berkshire RG31 6FZ. The Club reserves the right to cancel the event should 5 or less crews enter, entry money will be returned to any crews entered. Maximum entry will provisionally be 130 cars, a reserve list will be operated should we exceed this number. An Entry List will be published in the Club Magazine, Club Torque and as part of the Club Triumph website. 7 Drivers Meeting: Information about this meeting will be sent to all Entrants in due course. At the time of writing the Drivers Meeting is provisionally booked for Saturday 24th September 2016 at the Motoring Heritage Museum, Gaydon, Warwickshire. It is considered important for crews to attend this meeting to enable collection of the Entrant Packs and to fully preview the event. 8 Documentation/Scrutineering: The signing in will take place between 13.00 to 17.30hrs on the Friday at ‘The Plough’. Crews arriving after this time may be refused entry into the event. A dis-claimer is to be signed that states that the car and crew are insured as required by the Road Traffic Act, and that the vehicle is currently taxed and has a valid MOT certificate. 10 Costs: All expenses such as, car preparation, fuel etc will be met by the crews. The money for this is not to be deducted from the Charity money that the crews raise. 12 Route: A Road Book containing an advisory route and a Control Stop signing form will be issued to all crews at one of the Drivers Meetings approximately 11 days prior to the weekend of the RBRR. ‘Satnavs’ can be used to navigate the route, way points for all Controls will be issued by the Organisers, however ‘Satnav’ itinerary files will not be issued. 13 Start: The cars will leave at 18.00 sharp, they will not be set off in any order. The cars will be helped to leave the start by Club Triumph Marshals, it is hoped that the local Police will also be on hand to assist in getting the cars away from the public house onto the highway. A brief pre-event Meeting will be held in the car park at 17.45hrs, all crews to attend. 14 Driving standards: Please drive within the requirements of the Road Traffic Act and with courtesy to other road users and participants. All entrants are representing the Club and the Charity. Reports of poor driving will be investigated and could lead to event exclusion. Once again, we remind crews that if tired, please swap drivers, do not drive if tired. 15 Finish: At the finish each crew must sign in and present their Road Book to the Finishing Marshal. Important Note: Should you have to withdraw during the event please contact the Club, details upon how to do this will be discussed at the Drivers Meeting and published and issued as part of the Final Instructions. To celebrate the 50th Anniversary of this event, the Club will be holding an evening meal at the banqueting barns at the end of the event, all entrants are encouraged to stay on and enjoy some food and drink. More information about this special aspect of the event will be published before the event. As the start venue will be different to the finish venue, it is important to consider this, should for example one be leaving a different car at the start. 16 Mileage: As a guide the total mileage should roughly be 2000 miles. 18 Data Protection Act: Prospective entrants and competitors are advised that information supplied on the entry form will be held on computer and will only be used for administration of the event. Do be aware that entrants names and car details will be posted on Club Triumph’s website and used within the Club's RBRR Message Service. However, Entrants can opt out of having their names shown, please see the Entry Form.